Years ago our colleague Didier Heslon was inspired while reading John 15 to do a photo shoot in a vineyard. 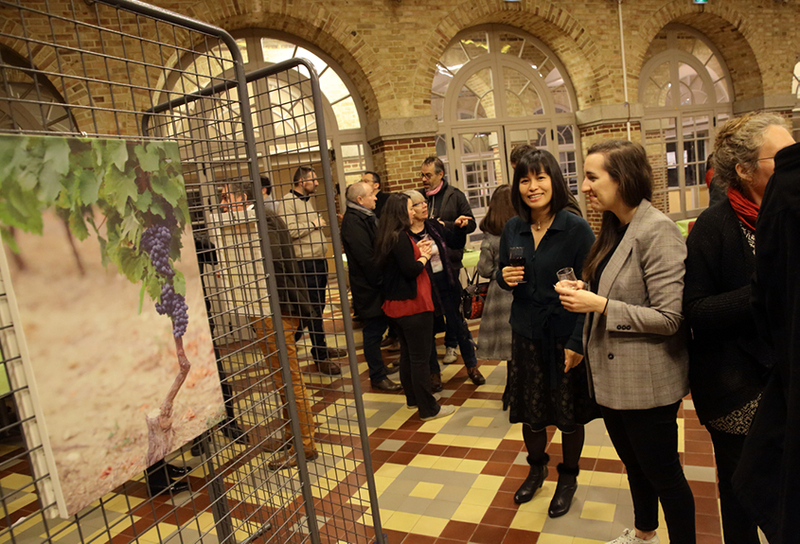 The result is a series of photos printed on canvas which artistically affirm Jesus' words to us. 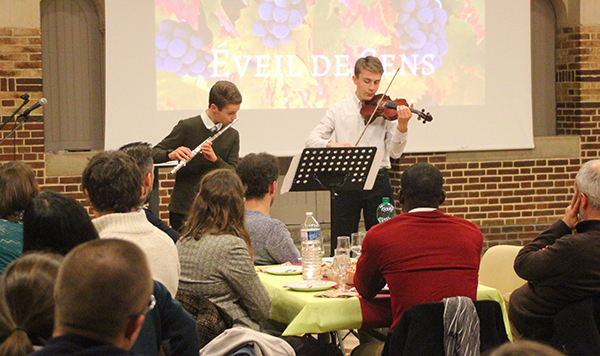 In 2010 the Cru team in Rennes developed an outreach event centered on these photos and the verses from the gospel of John. We sat around small tables with friends we invited and discussed "What kind of fruit do you want your life to bear?" and also "What is your vine, your source of life?" We liked it so much that this year we did a reboot! 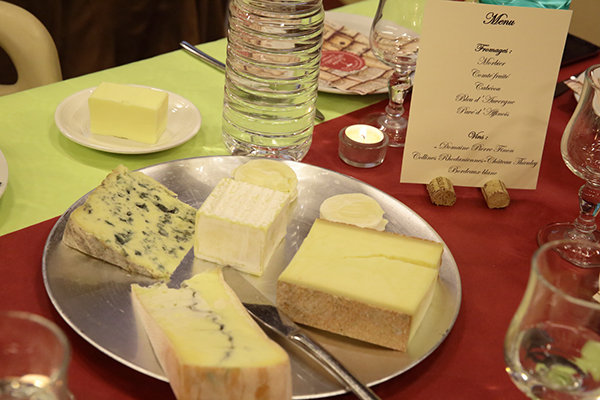 The ambiance was classy, with wine and cheese and authentic French baguettes. Jazz piano played in the background as people cheerfully discussed these deep spiritual questions. 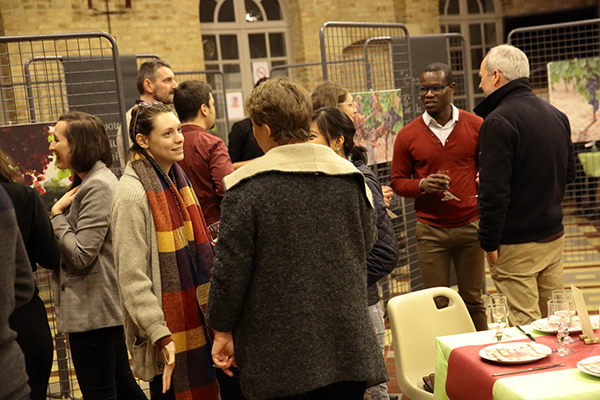 Christians around the table had a perfect opportunity to share with their friends how Christ is at work in their lives, all in a relaxed atmosphere. 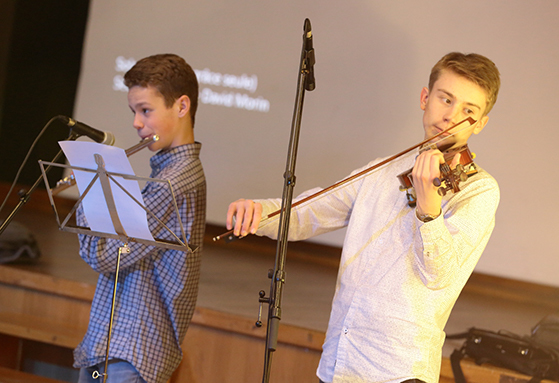 Silas and Efrem played a duet which was met with exuberant applause. Who knew sharing your faith could be so much fun! So what holds us back? Why do we feel anything but relaxed when we consider talking with our non-Christian friends about Jesus? It doesn't have to be stressful, and may be as simple as having a few good questions at the ready: How do you think faith or beliefs affect our lives today? What effect does it have for you? Who has had the biggest impact on your life? And impact for humanity? What comes to mind when you think of God? Or when you think of Jesus? Asking questions like these brings us into the heart of what is truly important. It is essential first to listen well, to genuinely care. Then be prepared to share your answers to these questions if possible. Put these questions in your pocket and pray for opportunities to ask them. It's thrilling to see God at work! The evangelistic outreach based on John 15. Silas and Efrem perform to the delight of the guests. Do you know a young musician who needs to see this video? for the follow-up to this evangelistic event and the discovery Bible study that's been launched. for good progress on France's mobile friendly site and the new donation site. for Silas and Efrem who have important tests for each of their instruments coming up. Two summers ago we attended our first Crescendo music festival in Tokaj, Hungary. We loved it! Crescendo is a ministry of Cru. Silas and Efrem both took master classes and performed, and I (Dan) was able to serve as a volunteer. This summer we look forward to being in Tokaj again. May and I were both accepted as volunteers, and Silas and Efrem as musicians. Do you know any young musicians who could benefit from high quality teaching and an amazing nurturing atmosphere? If you do, please share the video above and have them contact us! In the week before Crescendo, we will attend the European all staff conference. The last one was five years ago in Tallinn Estonia. This time it will be held in Switzerland. They're calling it the Family Gathering. With at least 900 staff in western Europe, this will be a big family reunion! I've been helping the Workmans for over a decade, my name is Samsonite, and I'm afraid I might never get home. I accompanied May to Orlando where she attended an IT conference with technology leaders from all around the globe. There were suitcases from fifteen different countries! The other suitcase owners talked about technology subjects like internet traffic and how to make sure people's data is secure. It's good to network and hear what everyone is working on, their weaknesses and strengths. We stayed there for a week, then we traveled back to France hoping to meet up with the rest of the family at the French national staff conference. If everything went according to plan, we would have arrived together in Vogüé, south of Lyon. This is where the narrative shifts from we to I, because I'm lost! May had to spend a week without any of the clothes, running shoes, or toiletries that I'm carrying. I also have quite a bit of Starbucks coffee that she was looking forward to enjoying. I sincerely hope the airline finds me, even after three weeks. Replacing me and everything I have with me will be time consuming and expensive! 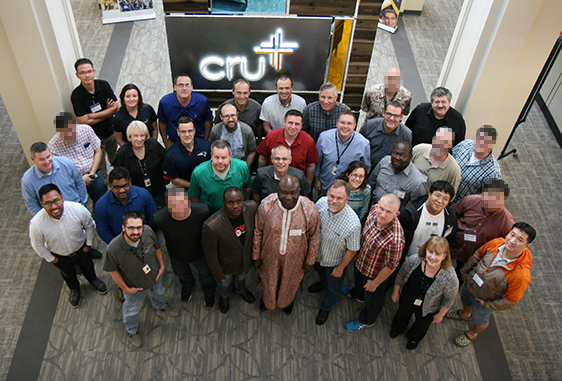 May with Cru technology leaders from across the globe. for the Lord to build the house, that we depend fully on him. for solid progress on France's giving site. for good communication and inspiration for the scripts and storyboards Dan is working on. 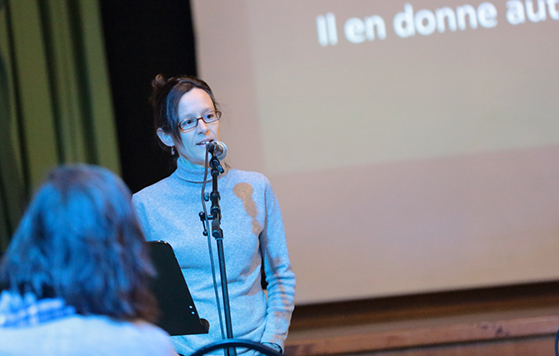 Speaking at the French national staff conference. Participating in the worship band. This year's staff conference held some surprises. Aside from May's suitcase being lost, there was quite a bit of snow, which is rare for that region. The usual leader of the worship team couldn't attend this year, so Dan was put in charge of making sure a worship team was assembled. He recruited a music student named Pablo who we know from church to coordinate and lead worship. Pablo stepped up and did a great job! As a long time part of the worship team, Dan coached him through some particularities and gave advice on how to be well organized. 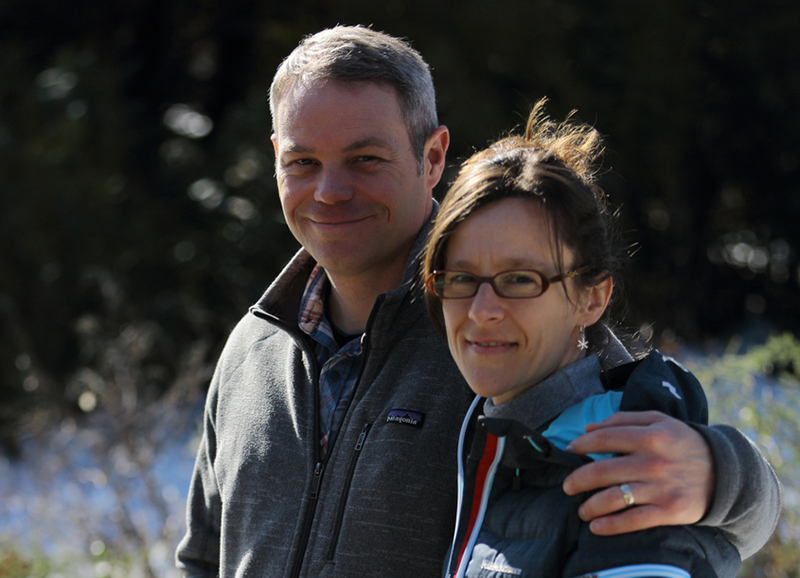 Pablo has been hoping to gain exactly this kind of experience, and Agapé France was very blessed by his contribution. Dan played bass, Silas the violin, and Efrem, flute. It was a lot of fun. We always enjoy seeing our colleagues. They have become like an extended family. May was asked to give a short devotion in front of everyone. As tempted as she was to talk technology, she approached it from a different angle, Psalm 127. Unless the Lord builds the house, those who build it labor in vain. May deftly compared the technology solutions she develops to a house that needs renovation. This is how the Lord has been speaking to her lately as she leads the technology team. She took the opportunity to challenge us all to consider whether we're working with the Lord or on our own. It was a great reminder that everything is spiritual work, whether it's programming or leading a team or having spiritual conversations. So, what is the Lord building in your life right now? What would be impossible without his help?